Carl Hayward "2005 Local Hero"
Standing in at an imposing 6’4” with a tremendous wingspan, Carl Hayward was a dominant force in the line-up at Huntington pier during the 1970s (his friend and ex-partner Dwight Dunn called him an “animal” in the water). A master tuberider, his penchant for riding the rocket fish design would became his calling card both as a shaper and a surfer. Born (1956) in Massachusetts, Hayward moved to Huntington Beach from Providence, Rhode Island with his recently divorced mother at the age of 13. Although his ascension into the tight-knit group of south side locals was difficult early on, he quickly became one of the best young surfers in Huntington. His interest in surfboard design developed early too, and he enjoyed telling his family the story of how his stepfather handed him $25 and told him to “go figure out what you want to do with your life.” Hayward used the money to buy a surfboard blank and built the board from scratch. Surfboard shaping would become a passion he carried for the rest of his life, and for over a decade and a half it was a business as well. After graduating from Edison High in 1974 he began shaping for Infinity Surfboards and eventually Wayne Brown Surfboards. From 1979-1988 he ran Carl Hayward Surfboards from three different locations on Main St. (one store survived the Jack’s Surfboards fire, another escaped the 1984 Op Pro riot), and it was here that he refined his rocket fish shapes--the design for which he is most associated. During this time he coached the Marina High surf team, including Gary Clisby and Scott Farnsworth, many of whom remember Hayward as a mentor and role model. Farnsworth went on to famously win the 1984 World Amateur Championships riding a Hayward-shaped board. After re-locating his shop to San Clemente in 1989, he closed his doors in 1991 and began working for long-time friend Bob Hurley. Starting in the Billabong USA warehouse, he eventually rose to Director of Pintables at Hurley International. 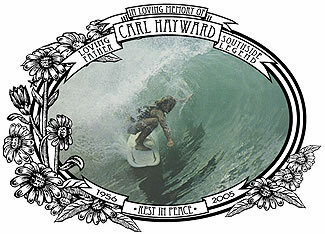 Hayward passed in January 2005 from a brain aneurism he suffered while surfing his beloved south side Huntington pier. He is survived by his wife Colleen and three sons.